Have you ever been to Libya? No, me neither. But there are a lot of people in print, on radio and TV these days who have been. Or certainly from the way they report the fall of Tripoli and the collapse of the Muammar Gaddaffi regime, they must have been, because they are as one in welcoming the end of what Miriam O’Callaghan, among others, described as “the end of the 42-year reign of terror”. On TV we get shots of guys tearing up or driving over posters of Gaddafi. On RTÉ earlier this week, a young Libyan woman living in Dublin who’d visited Libya annually since 2000 spoke of the pervading sense of fear in the country. Mind you, until prompted, her main complaint had been that young people were going to college, graduating and then having no job, and if you don’t know where that reminds you of, stop reading now, would you? Thanks. So what sort of place was Libya under Gaddafi? Well, it certainly wasn’t a democracy – Gaddafi took power over forty years ago and held on tight until recently. We’re told that he operated a massive system of secret surveillance of the population, that people were imprisoned without trial, that in some cases he had his political enemies killed. Not nice. And if you don’t know where that reminds you of, stop reading now, would you? Thanks. Did he do any good during his time in power? Well, nothing to speak of, not if you’re reporting for the BBC or ITV or in The Sindo. But if you dig a bit it’s there. When he came to power in 1969, a barrel of oil was sold to the West for 40 cents – exploitation on a massive scale. Gaddafi got the Arab world to withhold their oil and by 1973, they’re getting $40 a barrel. In Libya itself he built roads, he created jobs. He saw to it that all Libyan children had a free education. The country now has a high literacy rate and six universities. It’s got a health care system and along with subsidized food, this has reduced infant mortality from 105 per 1,000 live births in 1970 to 20 per 1,000 live births in 1998. So why don’t we hear that side of Gaddafi’s time in power, as well as the “reign of terror” claims? Well, maybe for the same reason that the rebels’ success is presented in terms of happy Libyans firing their guns in the air rather than in terms of NATO bombings and the secret placement of Western SAS-type personnel on the ground: because it looks better if it seems the Libyan rebels did it themselves. Except they didn’t. It was Western intervention decided the fate of Gaddafi’s regime. One example: since the start of April, the US has carried out over 1200 air strikes and over 100 Predator drone strikes against Gaddafi’s forces. And why did the West get involved? The official reason is that Gaddafi denied his population human rights (and would the person who shouted “So are they going to intervene in China, then?” please leave the room now). The real reason is…I can see you’re ahead of me…oil. Libya produces about a million barrels of oil a day and it’s very good quality. Gaddafi from the start made it clear that he wasn’t going to dance to the tune of the Western world at the expense of the Arab world. That’s why the West has always detested him. Not because he denied the Libyan people democracy (which he did) but because he refused to be a puppet of the West and encouraged others to act likewise. I haven’t mentioned the arms shipments Gaddafi sent to the IRA in the 1970s? That’s true. Just as I haven’t mentioned the £100 million–worth of arms – tear gas, chemical weapons, electronic equipment – Britain sold Gaddafi between 2005 and 2009. But listen – shhhh. Don’t talk about that, it complicates the picture. Let’s just keep it black and white, OK? Now repeat after me: “Gaddafi bad, rebels good”… Now you’ve got it. Jude, you'd like this guy, WarTard… interesting reading.. a nice and cynical approach. Yes and no doubt he got the trains to run on time. You are so determined to make it a Brits bad story you perform torturous convolutions to make this about them. Western governments do a great many bad things, but at least we can in theory vote them out. How would that work in Libya again…I can see you are ahead of me…it wouldn't. Yip Jude,im with ye, but can ye explane South Africa?.surely the know this is the rebirth of colonialisation and why did they sit and watch.? Should they not be afraid of the loyalists in S.A .i think they made a big mistake. 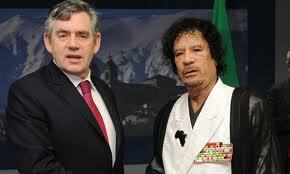 Now it turns out Britain was propping Gaddafi up, I presume you are suddenly not a fan after all. when are they goin to pull down the statue? Surely the arms shipments sent by Gaddafi to the I R A in the 70s are very relevant.Im sure some of the victims of the I R A would appreciate your views.But I suppose we are unlikely to read any criticism of the I R A on your blog!